Marine ecologists call them seagrass meadows. They once wrapped Australia's coastline providing sanctuary and food for dugongs and turtles, habitats for fish to breed and myriad other ecosystem services such as nutrient recycling and sediment stabilisation. Now scientists believe these humble plants could be crucial in the fight to address climate change. Seagrass, it turns out, is 35 times more efficient at locking up, or "sequestering" carbon than rainforests. Atmospheric carbon dioxide levels are now so high they risk damaging our ecological life-support systems and seagrass could play a vital role in helping reverse the earth's dangerous warming trend, says University of Technology, Sydney (UTS) scientist, Dr Peter Macreadie. "If the amount of CO2 in the atmosphere reaches 450 parts per million, the Intergovernmental Panel on Climate Change – the world's 'climate change referee' – estimates we will only have a 50 per cent chance of avoiding the drought, famine and widespread species extinction that is expected from a two degree increase in temperature," Dr Macreadie says. "I don't want to leave this legacy for my children. Through my research, and that of my colleagues, I'm looking for ways to maximise carbon sequestration with seagrasses and minimise the amount of carbon leaking into the atmosphere. "What seagrasses are doing is not complex. They are simply capturing and storing carbon through photosynthesis and by trapping particles in the water column. This process – known as biosequestration – is what created fossil fuels in the first place." The ability of seagrass to absorb CO2 could be worth as much as $45 billion, based on the current carbon price of about $23 per tonne, Dr Macreadie says. 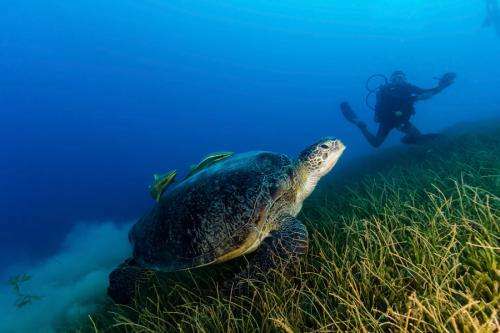 It is a conservative estimate based on only one species of seagrass, Posidonia australis. It is a compelling reason to protect seagrass meadows around the world, which are under threat from coastal development and nutrient runoff. NSW alone has lost 50 per cent of its seagrass, he says. Ironically, it was one of Australia's more audacious development proposals that helped Dr Macreadie tap into the value embedded in seagrass meadows. In 1969, the Australian and NSW governments explored the possibility of building a large nuclear power station at Jervis Bay on the NSW coast. Studies were carried out including seismic testing that blew away large areas of seagrass. It could take another 100 years for seagrass to refill the massive holes, which are so big they can be seen from space. But the holes have allowed Dr Macreadie to take sediment samples from the damaged area and measure the carbon that was lost. "The vast majority of carbon in seagrass meadows is actually stored in the sediment and can remain there for thousands of years," Dr Macreadie says. "The danger is that by destroying seagrass not only are we pulling less carbon out of the atmosphere, there is a risk that millennia-old carbon stocks could be released back into the environment. We are talking about amounts likely to be in excess of three times Australia's annual greenhouse gas emissions. This would mean seagrasses would shift from being carbon sinks to carbon sources, thereby accelerating climate change. "Our research will help quantify some of the unknowns about carbon leakage and, I'm hoping, add weight to having carbon sinks like seagrass included in the National Greenhouse Gas Inventory [the Federal Government's compilation of Australia's emissions data]." If that happens, seagrass could help Australia meet its global obligations to reduce greenhouse gases and help regain control of the planet's thermostat, he says.